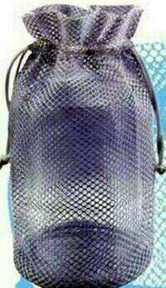 Custom Nylon Mesh Drwawstring Bags Personalized in Bulk or Blank. Promotional, Inexpensive. Bulk discount mesh drawstring bags, personalized with your custom imprint. 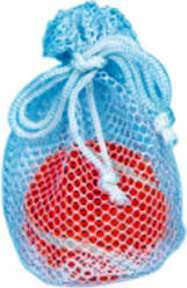 Budget Prices in USA and Canada for wholesale personalized mesh drawstring bags. American clients pay no taxes. 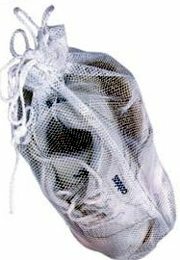 We also supply wholesale blank (not imprinted) mesh bags: contact us for pricing. Our promotional mesh bags are ideal for holding food, cosmetics, golf accessories and stationery. Free artwork design. We will send you a proof for your approval before production. Unit prices below Include your one color custom imprint. Extra imprint colors: add $0.35 per color, per mesh bag. Setup Charge: $40.00 per color; $10.00 on re-orders. 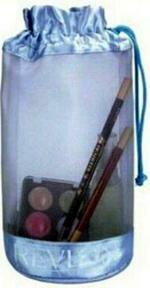 Features : Convenient bag with drawstring closure, great for tennis ball, lip stick and small sample sets. 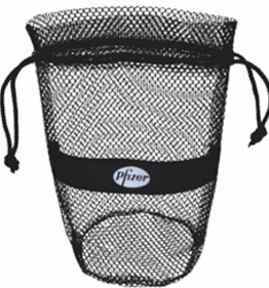 Features : See through mesh bag is perfect for lotions, hair~styling products or just about anything you can think of! Features : Vinyl base for added support to carry shampoos, lotions and creams, etc. Features : Great as a shoe bag or any of your larger items. Features : Large main compartment w/drawstring closure. Perfect size for carrying basic cosmetic accessories. Production Time: 6-9 working days after art approval.